My wife Christine and I were never “pet people”. Yeah, we use to think puppies and kittens were cute, but the thought of having a pet live in our house never crossed our minds. We were both a little uptight (okay a lot) about everything being in perfect order; not just around the house, but in our lives. We were in control of everything and we really didn’t want to have to clean up the yard or deal with dog or cat hair around the house. Not to mention we were both workaholics that put in long hours, so the thought of having a pet to take care of was just another stress we didn’t want or need in our lives. On many levels (okay most) we were perfectionists. I would spend a lot of time making sure my yard was the “perfect” color green and no weeds. Adding dead spots or overly green spots to my yard as a result of having a dog wasn’t something I wanted to deal with. Even the thought of such a thing stressed me out. I’ve always had respect and love for animals, I just didn’t want them living in my house and to be honest, I was always a little uneasy around dogs. My wife was even more adamant about not having a dog in our house, which worked for me since I felt the same way. But in November 2004, the unthinkable happened to my wife and me. We experienced the death of our first child, Katie. The loss turned our world upside down and the reality of all of the “stuff” we thought we had control of finally revealed itself. The reality was we didn’t have control over anything and that became even more evident as time progressed. My wife started into a depressive tailspin that I didn’t think she would ever pull out of, and at the same time, I became an even bigger workaholic to avoid dealing with my pain and to try to keep control of everything in my life. I treated Katie’s death like other roadblocks I had experienced in my life. Obviously, these other “roadblocks” were nowhere near as profound as the death of a child, but I didn’t know how else to handle it. I thought I could just bury it deep and keep moving in another direction. The problem was I had no idea which way that direction should lead. Where was I going in life? Why was I working so hard? What was I trying to prove and who was I trying to impress? In June of 2006 my wife and I again experienced the unthinkable, the death of our second child, Noah. I was still trying to survive the death of Katie and now here I was trying to figure out how I was going to survive the death of my son. I realized I could no longer run from my pain. My body wouldn’t allow it. I was spinning out of control and headed into a spell of major depression. I couldn’t stop it; I believe I was watching myself slowly dying. I was dropping weight at a rapid rate because the stress and the depression had taken away my appetite and the thought of eating actually made me gag. I was in trouble but my pride was still trying to ignore the fact that I needed help. It was a few months after the loss of my second child, Noah, when my wife started to ask me if I wanted to go see puppies at the local pet store. She said, “Noah must have liked dogs because I feel this strong sense to go and play with puppies.” Of course I said yes and went with her. Who doesn’t like puppies? Noah was a baby when we lost him and I thought that maybe the attraction to puppies was Christine’s way of releasing some of the love. Neither one of us had it in us to hold other babies because it inflicted a lot of pain and memories of Noah. Many family members and friends that had babies didn’t understand this, but it was very difficult for us so we just stopped going to functions where there were babies. I know it sounds selfish, but we had already experienced a lot of pain and there was no sense in reopening wounds that were still very much healing. In the month that followed Noah’s passing, we would spend hours at the local pet stores, picking out puppies and sitting on the floor of a visitation room with them. My wife would let them lick her face and would smile when they would snuggle up to her neck when she held them. Truth be told, I did the same thing. It just felt like there was so much love that needed to be released and these puppies were happy recipients of it. There were many times when just holding these beautiful puppies would trigger both of us to start crying because we knew the pain that both of us had buried deep inside of us. We would try to hide it from the sales people so they didn’t think we were crazy. After doing this for a couple of months, my wife started saying things like, “We should get a puppy.” I wasn’t there quite yet and would say, “Let’s do a little research on the type of dogs that are out there to see if any fit with what we may want in a dog.” My hope was this would deter her from thinking much more about it. Then to my surprise she came home with a book about different breeds of dogs. After speaking with friends and family members that had dogs, we settled in on a breed known as Havanese. They don’t shed, they have a calm demeanor and they are loving dogs. Perfect. Since this breed was kind of an unknown breed and they are expensive, we found that many pet stores didn’t offer them. So we did an online search and found a breeder about an hour away from where we lived. The name of the breeder’s business was called Noah’s Rainbow. As soon as the webpage popped up I knew we had found the right breed and breeder. We believed Noah really was sending us a message. We spent another month visiting the website looking at the puppies they had until we got the nerve to call the breeder to schedule a time when we could visit the available puppies. We decided to visit on a Saturday in early December. It was a gloomy, snowy, Chicago weather type of day. We arrived at the house and when we went in, they took us to one of the rooms that had several eight week old puppies running around and playing with each other. We spent a couple of hours with these dogs trying to determine which one was perfect for us. We thought we found the one we wanted and decided to go home that night and think a little more about it since these dogs were $1,500 and we were still emotional wrecks and deep in our grief. We decided that we were strong enough to handle the additional responsibilities and returned the next day to pick up our new puppy. He was so scared on his way home that he just sat quietly on my wife’s lap with the sweetest look of sadness on his face. Once we got home, I let him lay on my chest for several hours while I held him and he gave me kisses. Later that evening, my wife started to cry and said she didn’t know if she could do it. I became irritated because we had been researching this, thinking about it and talking about it for several months. I wasn’t mad at her, just frustrated with the situation. It had only been 6 months since the death of Noah and 2 years since the death of Katie, so we were still living in a major fog and were just looking for something to help us out of the pain that we walked around with every moment of the day. We had not named him yet, but that evening while I was laying in bed half asleep thinking about him, his name came to me. Woody. That will be his name – Woody. I was hoping that the next morning my wife would feel different about not being able to handle the addition of this puppy in our lives. Unfortunately, that wasn’t the case. She was even more adamant about it. We talked about it for a few hours and came to the conclusion that we would call the breeder and see if we could return Woody. I called the breeder and explained the situation to him, he said to bring back the puppy and he would give us a refund. I was heartbroken because I had already started to bond with this little guy. When we arrived at the breeder’s house, he met me at the front door. While I was handing Woody back to the breeder I started to bawl while I was standing in this guy’s living room – not just the shedding of a tear, but a full blown physical weep. I am sure he thought I was over reacting, but given the circumstances and what was going through my mind, I wasn’t. The simple task of handing over the puppy I had only known for less than 18 hours seems like it wouldn’t impact the normal person, but at this point in my life, I wasn’t feeling the way I normally would. I was screwed up inside. Very screwed up. When I handed him the puppy, I had flashbacks to when I handed my son Noah to the nurse for the last time. The nurse took him and I never saw him again. It took me right back to the moment and the pain of the situation. Returning Woody sent me deeper into depression and I spent the next couple of months fighting my way out of it. Saying goodbye to Woody was symbolic of me saying goodbye to Katie and Noah. It was a reminder of the pain of saying goodbye to my beautiful babies that I missed so desperately. About 3 months had gone by and my wife started to ask if we could go to the pet stores again and look at puppies. I was a little hesitant, but knew it couldn’t hurt anything to spend some time with these furry little friends. Not to mention, she had already said she couldn’t handle the responsibility of taking care of a puppy. So we went, several times per week. And then it happened, she told me she thought she was ready for a puppy. I wasn’t ready for this, the thought of getting another puppy and then having to return it the next day because she changed her mind was not something I wanted to experience again. I was worried about having a setback with the depression I was fighting my way out of and seemed to have been winning over the last month. It was in the middle of the week and we had been out for dinner when we decided to stop by the pet store on the way home that evening. They had just gotten in some new puppies that day, so we picked out a couple and did our usual routine of sitting with them and holding them. And then as we returned one of the puppies to the sales associate, we decided to take another look at the new puppies. Behind the glass, this little tiny puppy with big brown eyes, floppy ears and a cute pink tongue was looking at us. He looked ornery, but we decided we wanted to play with him before we headed home for the evening. We bought that little puppy that night but we couldn’t take him with us yet, because he had to have a minor surgery completed before we could take him home. We spent the next two days buying all the stuff we needed to take care of our new friend. So far my wife was still excited about it but I was still concerned she would change her mind, even though this time I told her if we get the puppy we are keeping him and we’ll find a way to make it work. Finally, we got him home and we named him Buddy. I was still dealing with grief and sadness so over the next couple of months I would hold Buddy every morning on his back and I would tell him about my son Noah and I would cry and he would lick my tears away. Buddy is a Shih Tzu and he is stubborn beyond belief, but he is also a great friend and I am happy that he is a part of our lives. He has brought laughter, love and excitement into our lives and has changed us from the people we were to the people we are today. My wife and I believe that Katie and Noah sent Buddy to help us through the most difficult time in our lives. Katie, Noah and Buddy have taught us to relax in life and to not take it so seriously, reminding us that nothing is perfect and we are not in control of anything. The pursuit of perfection and money is elusive, because no matter how hard you try, perfection is never achievable and the money is never enough. At any given moment, our lives can be turned upside down, so enjoy the good moments and try not to stress about the little things in life. You will probably recall the dog stories I have shared here. The first was Maggie, who showed up six months after my son’s death but died from a weird reaction to anesthesia after a hernia repair. I only had her a week, and her death taught me that I could handle more loss because nothing compared to Keith’s death. I also shared about Michael, a black lab that showed up one day and needed a home. After a second lost puppy landed on our porch, I decided that God really wanted me to have a dog. As Michael continues to grow, I’m wondering if He actually wanted me to have a horse! Michael is nine months old and getting close to 70 pounds. Never before have I had a dog love me the way he does. I think I shared that my daughter-in-law told me Keith always wanted a lab – something I never knew. It seems to be one more thing that I can do that he cannot. I’ve actually been growing my hair because he made a comment about wanting to grow a pony tail after so much chemo-induced baldness. It is amazing how much healing can come from the unconditional love of a dog and from embracing my son’s wishes and dreams. Life really can get better. It is never easier, and I always wish it were different. But finding ways to live – even the four-legged monsters that wreck our yards – honors the ones we grieve. I do recall your dog stories. Not sure if you remember the story in my book about the dad who “adopted” his sons dog after his son passed and how he is connected to this dog. I do believe our children send us these “furry friends” to care for us and love us. They understand and feel our emotions more than I think we will ever know. There are still times when tears will flow and this little guy jumps up on my lap and trys to playfully bite my nose, its his way of saying “its ok, I am here for you”. Thanks for sharing these great stories. We just got a Havense. Cute little guy we named Fozzie. When my son’s dog Shadow died two years before my son I was heart-broken…but not near enough as compared to the loss of my son. This little Fozzie is a little prankster who does bring some laughter back to the house. Having some laughter brought back into the house is a huge huge thing. I was surprised at the amount of love that poured out of me for this little furry guy. They do bring you smiles, I’ll take smiles anyday. Thank you for this touching account of your journey back to some sort of normal. We loss our only son Kyle just over 2 years ago . 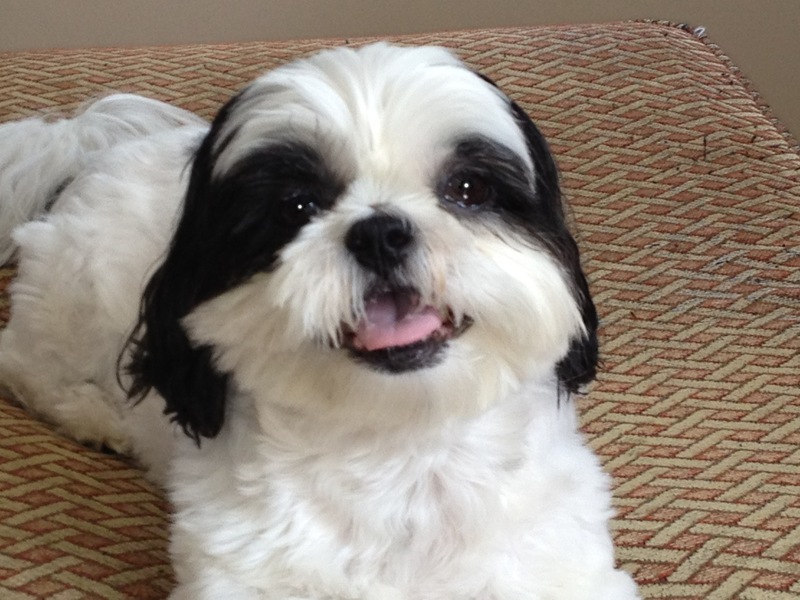 We also had a Shih Tzu named Comet that our son picked out when he was 5 years old. Kyle had just turned 20 when he was in a car accident and Comet helped you through some tough days and nights. We had to also let comet go about a year ago but we find comfort in knowing he is now in heaven with our son Kyle once again givng puppy kisses from us . No day is ever normal again by we try to make our son proud each day !! You are welcome for the article, I am sorry for the loss of your son Kyle and Comet. I am sure the loss of Comet triggered a lot of emotions since he was so close to your son and it was something you could still hold onto. I am confident they are both enjoying each others friendship. You are correct, no day is ever nornal again but the only thing you have is to live each day that would make Kyle proud. Thanks Marty! I have to tell you, handing Woody back over was a difficult task that triggered a lot of emotions. All i could think about was handing my son Noah over to the nurse. This event sent me into a deeper depressive episode for for about 3 months. I am so very sorry for your Loss , my heart aches for you …I understand your pain , we lost our precious Daughter on Oct 20th/2011. It is a difficult journey ..
Our Girl, gone too soon….